Work Smarter not Harder… The difference between a workaholic and a top-performer. High performers know their own value. Workaholics allow others to determine their value. Gordon ascertains that a top-performing individual knows their own self worth. They are constantly self-evaluating and giving themselves feedback rather than waiting on the approval of others. Comparatively, a workaholic relies solely on external validation from a boss, co-worker, or client. High performers give 100% at the right time. Workaholics give 110% all of the time. High performers do business. Workaholics are busy. They’re not credit cards. They’re not debit cards. They’re a lot like gift cards – but not really. So where do they fit? These handy, reloadable cards function like a debit card, but are not linked to a bank account. Like a retailer’s gift card, the funds are loaded onto the card itself, but unlike these cards, the money can be spent anywhere a Visa, MasterCard, and other debit/credit cards can. As more purchases are made electronically, there’s a growing need for people without credit cards and bank accounts to enjoy the same benefits as those that do. These days, prepaid cards are used for everything from managing budgets (as a way to restrict spending), to distributing government funds (like receiving tax returns, Social Security and unemployment benefits), to payroll distribution and generally as an alternative to checks, credit, cash, and traditional bank accounts. In 2013, the FDIC estimated that 17 million adults (8% of American households) were without a checking or savings account. Prepaid cards provide the “unbanked” (and those with poor credit) a means to save money electronically, transfer and receive funds, access ATMs, and enjoy many of the conveniences that credit and debit cards provide. Visa and American Express launched some of the first prepaid cards in the early 2000s as a way to help parents put aside and track funds for their teenage children to spend. Since then, the use of prepaid cards has grown significantly with the amount of money loaded on them tripling from 2008 to 2012 to $76.7 billion (according to a new report from Cardhub). Today, there are a myriad of prepaid card issuers—including financial institutions, and non-bank heavy-hitters like Wal-Mart and Google. The uses for prepaid cards continue to expand as a widening array of consumers discover new ways to benefit from this type of financial vehicle. For one thing, the fees on prepaid cards can be high, especially compared to regular checking accounts. Users can be charged a fee for the card itself, then again to load funds, and again to withdraw funds. In addition, since prepaid cards aren’t tied to another financial account, they won’t help you build a credit history the way a credit card will. And unlike credit cards, most prepaid cards fall short when it comes to offering benefits like air miles and protection against things like fraud. The fee structure is still a hot topic, and as of right now, fees vary significantly amongst issuers. It also remains to be seen whether prepaid cardholders will be able to graduate to other financial products the way bank customers can. And while bank accounts have clear rules on things like overdrafts, these and other standards are still unclear for prepaid cards. Overall, the full potential of prepaid cards as a financial vehicle is just now coming into focus. Despite the uncertainties, one thing seems very clear. As the move to electronic payments grows along with the number of unbanked households, prepaid cards appear to fill an important need in the expanding and rapidly evolving world of payments. Bitcoin: Is digital currency here to stay? Conceived in 2008, and used by over 100,000 people around the world, Bitcoin is a whole new kind of money—an electronic-based virtual currency that many of today’s top tech leaders consider the wave of the future. It allows people to buy and sell goods and services outside of banks or governments involvement; Bitcoin is an open-source system—the world’s first community-controlled monetary system. And it’s growing. While bitcoins are still in their infancy, the potential advantages of this system have a lot of people excited. Transactions are encrypted for security and can be made anonymously 24/7 from any computer or mobile device. Simple, convenient, fast, and globally universal, bitcoins are independent of politics, regulatory constraints, and manipulation by any centralized institution. With more and more aspects of our digital lives becoming community-run—from email, to social media, to many of today’s web-based apps and software systems—could our currency be next? Might we all soon be asking how many bitcoins it costs for that shirt or sandwich? Time will tell. d.trio is proud to help support an exciting new charity: CycleHealth. Their mission is “To create a new cycle of health in America, starting with the youngest generation.” They do this by promoting a series of ‘kid adventures that matter’, meaning that participants are not only improving their own health but also raising money for local organizations involved with pediatric health care. 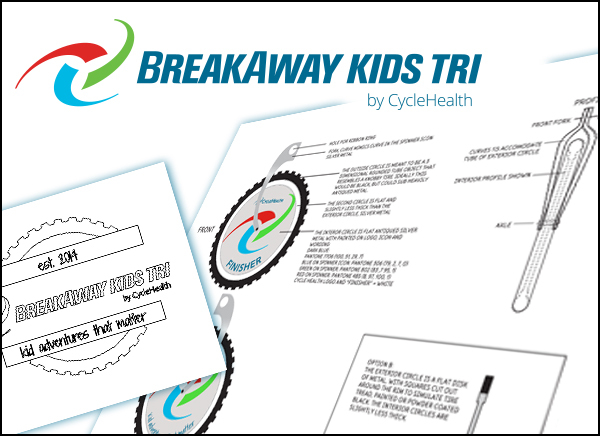 The first big event is the BreakAway Kids Tri, a triathlon for kids which takes place on August 23 at Lake Elmo Park Reserve. d.trio is designing the finisher medals and t-shirts for the event. We can only show you work in progress at this point but stay tuned for the finished products and while you’re waiting learn more about CycleHealth. Augmented reality may finally be getting cool enough to actual use in support of print advertising. More magazines are adding the ability to use it within their pages and many have even done special issues showcasing the ability. Add to that augmented reality applications for outdoor and window displays, it might be time to take another look. See the following links for some really great examples. I do a lot of bicycling. For workout purposes all year and to-and-from work a couple days a week, Spring through Fall. Outside of the obvious cardiovascular benefits derived from the exercise, it provides me with rare “alone time”, free from common distractions (I don’t even wear headphones – for safety). It’s one of the only solitary things I do and I find it allows me to noodle on things, generate or refine ideas and concepts or, sometimes best of all, think about absolutely nothing. You know how many people say their best thoughts hit them while in the shower. Well, a long, rigorous bike ride is kind of like an extended shower. The familiar, rhythmic, repetitive motion of pedaling along releases the mind to free-associate and go down creative and problem solving pathways often otherwise unexplored. I am a gregarious person that usually draws energy and inspiration from being around others, but I equally value the solitary respite provided by a simple bike ride. Sometimes one is not the loneliest number. 3 tips for talking to designers. And 1 for talking to everyone. The way you speak to a designer can have a big impact on the result of their work. It may make the difference between them giving you their absolute best and them beginning to feel that they can only do exactly what you tell them, even if there may be a better solution. In the subjective world that is design, be careful of dictating, you may be unintentionally stifling the very people you count on to make your efforts successful. If you work with an agency you may not always have direct contact with the graphic designers working on your account, but these tips apply as well to the account executive who is tasked with translating your wishes back to their creative team. Don’t make us guess – you likely have a fair amount of information available (or at least in your head) about who your audience is and what has historically appealed to that audience. Share. Good design is based on as much relevant information as possible, especially audience, primary message, and branding information. Sure, we’ll always try to make you something visually interesting, brand appropriate and engaging, but we also want the piece to achieve your goals. “I’ll know it when I see it” – it’s perfectly ok to not instantly fall in love with the first idea we show you (we hope you will, but…). But the quickest way to make your designer feel desperate is to be vague about your response. Take your time and really figure out why you don’t like something. If you can’t find the words, ask your designer (or the account exec) to work through it with you until you’ve identified the problem, that’s their job. You’ll “know it” sooner then if you make us try to read your mind. And here is one word to remove from your vocabulary when talking to designers, co-workers, your mom, or anyone else: “Just”. As in, “can you just ____________?” The word “just” presumes that the given request is easily accomplished and therefore devalues whatever effort it will take to do the task. It puts people immediately on the defensive, especially if they are already tired or stressed or feeling underappreciated. Simple removing the word “just” from the sentence makes the sentence a request rather than a directive, and it will result in better work and more enthusiastic compliance. As a designer and a design agency, we take your business challenges personally. We feel great about our work only when it best serves our clients’ needs and meets the project goals. Communicating clearly and remembering that we are all on the same team is the best way to get fantastic work that we can all be proud of. As marketers, creative problem solving is something that we do on a daily basis. What helps us with that process is music and noise. To us, at times, it can be too quiet to think. Extensive research has been published regarding the topic of noise and brain cognition but recently there has been some insightful new information regarding the effect on creativity. There are even websites and apps now that will give you background noise to help your creative process. The research article: Is Noise Always Bad? Exploring the Effects of Ambient Noise on Creative Cognition published by The University of Chicago Press has found that noise can negatively and positively affect the creative process. In the research they note that there have been a lot of studies that determine noise can ruin someone’s concentration but that creativity is more difficult to measure (and a very complicated process). It turns out that a low to moderate level of noise (think coffee shop) provides just enough stimulation to boost your creative power. It’s not just because the music is good or you’re getting ideas from the clientele. It’s because noise gets you out of your head and works your brain harder. This leads to more creative, out of the box thinking. Just be sure not to blast music or go somewhere too loud because that could negatively impact your creativity. If you’re interested in getting a creative jump-start there are plenty of ways to do it at your desk while not taking time to go to a coffee shop or disturb your coworkers. Obviously you can listen to the radio or your music but it’s a lot more difficult to find the background chatter that a coffee shop can provide. I’d recommend trying www.coffitivity.com to find that coffee shop sound and finding a good playlist on Spotify (I prefer Office Detox or Your Favorite Coffeehouse). Hopefully this info has helped your creative process but if you’re still looking for a boost feel free to give d.trio marketing group a call! Note: Fred spends a lot of time on his bike during the summer. We are often treated to tales of his encounters along the way and he’s been good enough to provide us all with the following taxonomy. Proud, serious, usually speedy runners who believe their considerable athletic prowess is too constrained by the pedestrian path and feel that running against one-way bike traffic is somehow a logical and safe alternative. They will play “Chicken” with you and never flinch. Runners who insist on running on the narrow strip of concrete that in many places buffers the bike path from the surrounding grass. These folks must have been raised by tightrope walkers. They fail to grasp that their flailing arms and elbows tend to invade the bike lanes and that their precarious narrow beat requires their full concentration to avoid stumbling – keeping them from paying adequate attention to fast-moving rolling objects with humans aboard. Fortunately, a vanishing breed. These typically talented skaters are characterized by moving along the bike path in a serpentine fashion, gliding from one lane to the other almost always lost in a headphone-induced musical trance – and frequently can be seen going backwards. Often unable to hear your, “on your left” verbal warning. Rare, but extremely dangerous. These are usually pairs of folks carrying a canoe or kayak who pause to determine their best point of water entry while having their craft suspended between them, completely blocking the path in both directions. There is almost no way out when encountering this calamity. A group of 4-6 almost exclusively women who travel in a pack on the path, blithely and energetically discussing the latest book assignment (or something). These groups are impossible to disperse and should be given a wide berth, as their reaction to any audible warning is entirely unpredictable. Again, usually a group (sometimes friends or a family) who choose a random spot to stop for a water break. The buffalos themselves tend to make it off the path to rest and rehydrate, but they often leave all or part of their bikes parked on the path. Seriously? These technical terrorists are really scary. They’ll unexpectedly stop their bike mid-path, straddle it and begin texting. Called Tyrannosaurs because their arm positions while texting makes them look too small for the rest of their body. This is a wide swath of mouth-breathers (alone, in pairs or groups, carrying coolers, pushing strollers etc.) that are so hypnotized by their ultimate destination that they simply stride onto the path directly in front of speeding bikes. Do not warn them, as they will invariably stop on the path and stare at you like a deer in a car’s headlights. Hard to blame these folks as it’s not entirely their fault, but beware. Our culture frightens and confuses them. These are people from the ‘burbs who have rolled in to experience the urban landscape and know not of things like bike paths. The most colorful (and potentially deadly) beasts. This is a gaggle of middle-aged men, tightly stuffed into stretchy Lance Armstrong outfits, riding $3,000 bikes and traveling as a single, organic unit. Kind of looks like a bag of Starburst candies on wheels. Avoid at all costs, as the domino-effect crash that could ensue would be epic.